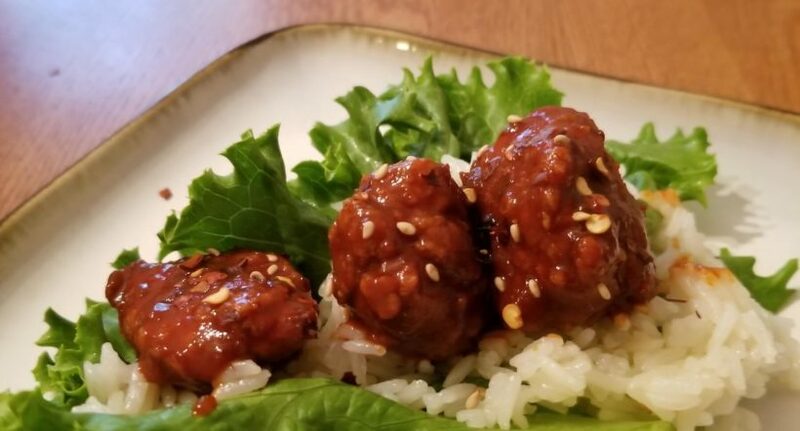 These Spicy Korean Fried Tofu bites pack a punch, and are sure to be a crowd pleaser! Swapping out the chicken for tofu provides a healthier, more environmentally friendly option! 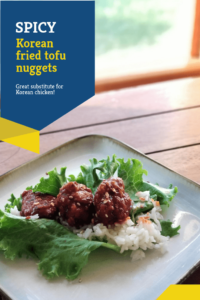 Start out a meal with these as a great appetizer or add some rice and lettuce leaves to make this a full meal! Mix juice, yogurt, paprika, oregano, garlic in a bowl. Pour mixture over tofu in container, seal, and refrigerate at least 4 hours. Preheat your oven to 350 degrees. Once the tofu has finished marinating, remove it form the container (save and set the marinade aside), cut the pieces in half, and place them on a sheet in the over for 30 minutes. Now remove the tofu from the oven and set aside. Pour the marinade used for the tofu into a shallow pan. Mix flaxseed with the marinade. Put your tofu pieces in the marinade, drip clean, in the flour mixture, shake off, and repeat so each pieces is in the flour and the marinade at least twice (this will ensure a thick breading). As each piece is coated, drop it into the oil to begin cooking. Monitor and remove to a paper towel covered plate once finished. Fry the pieces in batches until they are all cooked. Mix your sauce ingredients together as the tofu pieces cool. Add sauce and cooled pieces to a large bowl, mix to cover them all, and they’re ready to serve!